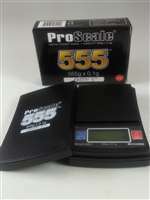 My Weigh Proscale 555 Johnny Five. 555g x 0.1g resolution. Small factor pocket scale. Weighs in grams, ounces, and pennyweight. Backlit LCD. Cover doubles as an expansion weight tray.